In a changing economic climate, it pays to do business with a company that has weathered the storm and navigated the ups and downs of the business world. PRINT-Xpress, the one-stop Skokie print shop, is just such a company. Since its start in 1978, PRINT-Xpress has been the go-to source for quality printing, done on time, at an affordable rate. The professionals at PRINT-Xpress are never too busy to talk with a customer. They make a point of finding out each customer’s needs and expectations first - before starting the job - so they get the job done right. Owner Sam Eckerling believes that one-on-one personal service is the key to gaining trust and maintaining repeat customers. His experienced staff oversees each job through all stages of production. They work hard at building the long-term relationships that have made them a success. Located in downtown Skokie for almost 40 years, PRINT-Xpress provides printing support for any type of business and handles every printing need. It’s the printer to go to for new businesses - or companies who want to update their professional image - because PRINT-Xpress products can improve a company’s visibility and create a buzz in the marketplace. 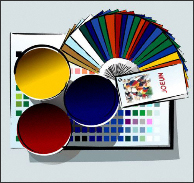 PRINT-Xpress has expanded its facilities through the years to include services such as 4-color processing, on-site typesetting, complete bindery, full-color products, and offers mailing and fulfillment support. "I recently started working with a not for profit and am glad I found Sam and Print-Xpress to help me with my printing needs. I have been impressed with the quality of work and turnaround time." "Carolyn was great. I'm in the health care field and received compliments from other colleagues on the quality of the card. She was easy to work with and made good suggestions regarding my cards, font, color etc... I will definitely come back. I initially tried to go to Kinko's, wow, that was terrible. If you want someone whose been doing this for a long time to work on your cards go to Print-Xpress. If you want that feeling you get when you go to Menards or Lowes where no one really cares, knows what they're doing or & want to sacrifice quality, go somewhere else." "I had just established a franchise business, and home office had demanding and high standards for print quality, from my business card to catalog sheets. This was not going to be something I could drop off at a big box store and pick up in an hour. Sam Eckerling and Carolyn at Print-Xpress were highly responsive, attentive to my needs, and very, very detail-oriented, working at times directly with the marketing staff at the home office to be certain everything would be correct. The results? The printed card, folder and catalog pages were absolutely stunning, truly representative of the quality image I need to project. I am a enthusiastically happy customer, and I will use Print-Xpress for all of my printing services needs." "The gentleman who runs this place, Sam, is the nicest man! What a great experience. I will definitely be back for more signage! "I have worked with this printer for many years. I always get excellent quality work, for very fair prices. Sam and Carolyn go above and beyond so that my projects are completed on time (and often ahead of schedule) and look amazing. I recently found out that they can print banners, so I will be utilizing them for this service as well. On a recent job, Carolyn called to let me know that certain aspects of my artwork needed to be fixed, and she very patiently helped me so that the job was printed perfectly." For quality printing at affordable prices, visit PRINT-Xpress. We have built our reputation on one solid premise - to do a quality job, on time and at a competitive rate. For more information Give us a call or stop by our location on Lincoln Avenue.